My friend, Ashley was visiting and I had promised dinner, but I hadn’t really planned. Towards the end of a busy semester, I find myself playing it by ear a lot; I just don’t have the wherewithal to do something that requires a lot of prep or advanced thought. I deal with things as they come up, and look forward to the upcoming break when I won’t feel so much like I am flying by the seat of my pants (what an odd idiom that is)! I knew I had a bag of shrimp in the freezer that had been waiting for me to come up with something and then I remembered a quickie solution I quite like: tangy, smoky shrimp with finger-licking good sauce that soaks nicely into rice, but can also be eaten on its own if you are looking to reduce carbohydrate intake. This was done in under ten minutes and made us very happy. One thing I like about this light treatment of shrimp is that you can eat a lot of it without the uncomfortably full feeling you can get from pork or beef). For a grilled version, click here. In a skillet, heat olive oil until fragrant then add onions, stir to coat and lower heat to medium. Saute for five minutes or until onions are quite soft. Add garlic and cook for another minute. Add passionfruit, chipotle and juice and stir to combine. 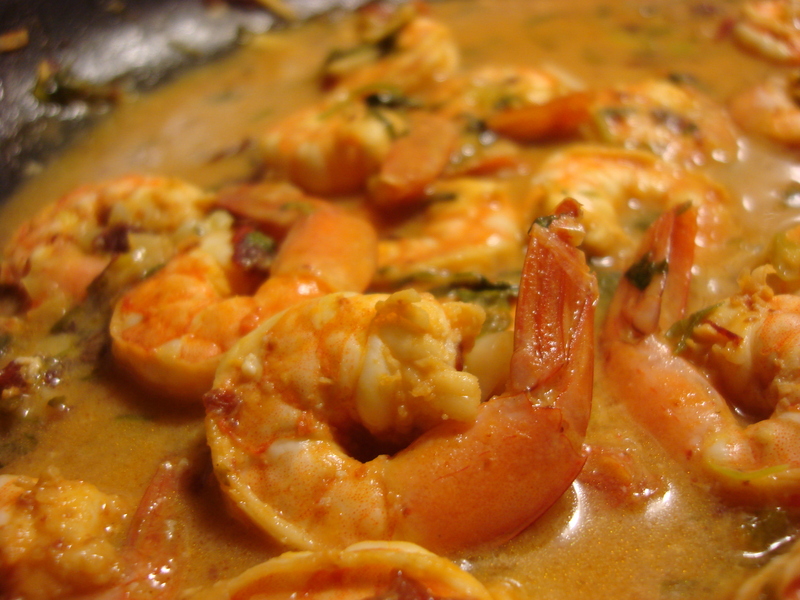 While it cooks for a minute or two, sprinkle shrimp with Adobo (go easy if you don’t like much salt). 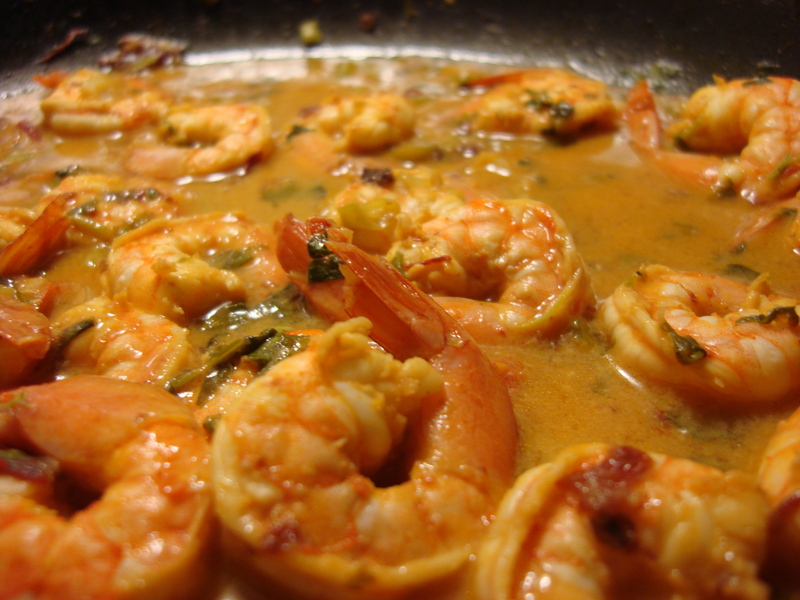 Raise heat to high, add shrimp and cilantro to skillet, stir to coat and cook for 3-4 minutes, depending on the size of the shrimp, until they lose their translucency and begin to curl. Serve over rice. Good cold too! 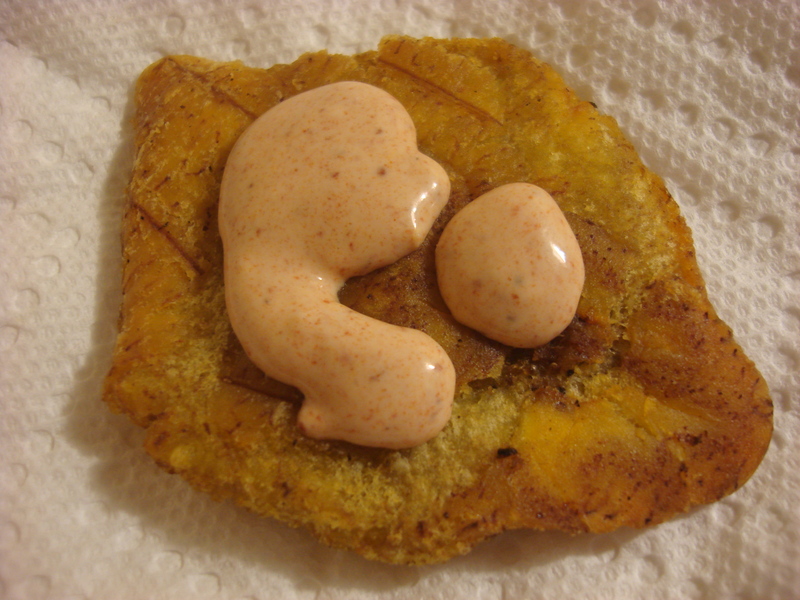 I had promised my friend Ashley and my son a “tostones-for-dinner” Friday night and, since I had the plaintains I was ready to go. Ashley had decided to learn to make them, so I set her up with the assembly line of garlic and salt water, hot oil, plates covered in paper towel and tostonera (See Tostones! for the how-to of this Caribbean riff on French fries) and got ready to relax with a bit of the fizzy stuff. 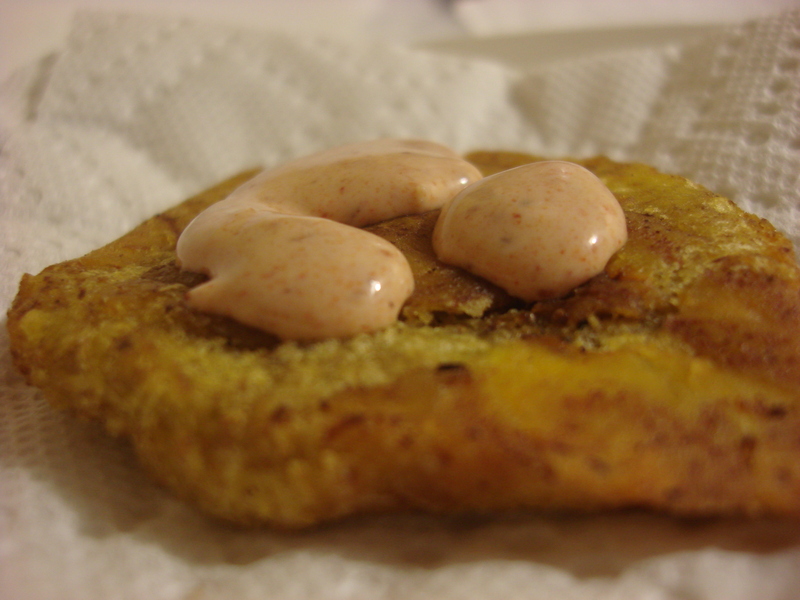 Then I mentioned that Puerto Ricans usually dip tostones in mayo-ketchup – mayonnaise and ketchup stirred together. Without hesitation Ashley said “That sounds like it would be great with chipotle and lime,” and since I had it all in (plus garlic) a new creamy, spicy, lick-the-bowl delicious dip was born. And it was so quick that I still got to drink that glass of fizzy in relative peace…. You. Are. Gonna. Love. This. Mix all ingredients in a bowl and serve with tostones or other fried, crispy tidbits.